Year-round the Tempel Lipizzan works to continue the education of the horses in order to advance them to their next level of training. That level is determined by their fitness, conformation and aptitudes. There are 70 Lipizzans at Tempel Farms, 35 of them in full training. 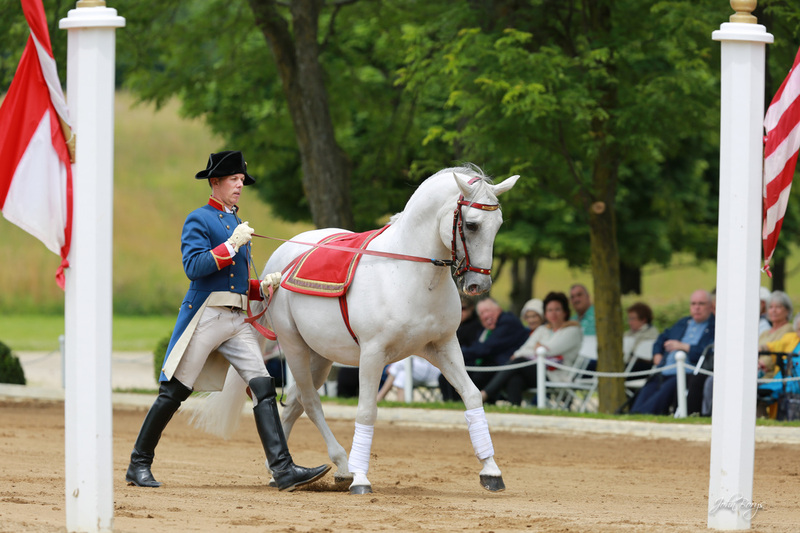 Find here the Tempel Lipizzans most highly trained horses doing the work of representing their breed and their training. About: Pluto Distinta was imported in 2005 to the Tempel Lipizzans from the Piber stud farm in Austria. He is an extremely talented horse and definitely a barn favorite. He has performed in the Young Stallions, the Pas de Deux, and the Quadrille. He has also been a successful competition horse and his trainer, Antonio, has hopes of competing him at the Prix St. George level in 2016. In 2015, he was one of the horses to perform in the Dixon Oval at Dressage at Devon for their 40th Anniversary Show. About: Conversano Bana Garcia heartily expressed himself as a youngster with a mind of his own. As will happen with some young stallions, physical and mental maturity don't always happen at the same time. He performed a handful of times in the Young Stallions segment, but became known as an instigator among his peers. Now he is serious about his work for the Quadrille, proving he could be an elegant and reliable partner with his trainer. In addition to maturity, we find that some young Lipizzans need to be challenged and their training routine must be diversified to keep their minds busy. In 2015, he was one of the horses to perform in the Dixon Oval at Dressage at Devon for their 40th Anniversary Show. About: Is this boy cute or what?? With his winning personality and adorable face Neapolitano IV Almira will win over just about anyone. Despite somewhat of an atypical conformation for his breed, he's talented at piaffe, passage, pirouettes, and he performs the Levade under saddle. He has been a part of the Quadrille for the past three seasons and is one of our highest level horses in the barn. In the off season, He loves being a school master for our working students. In 2015, he was one of the horses to perform in the Dixon Oval at Dressage at Devon for their 40th Anniversary Show. About: Strap a horn on this boy and he's a unicorn. Pluto III Ambrosia has a fan club wherever he goes with his dark eyes and long thick mane and tail. Not only does he have looks, but he's extremely talented in the dressage arena. He has competed through Intermediate I. In the performances he is in the Quadrille, but he is also our back up Solo horse. In 2015, he was one of the horses to perform in the Dixon Oval at Dressage at Devon for their 40th Anniversary Show. About: Siglavy V Garbo III is a do-it-all kind of horse and a soldier for our program. He's brave and seems to enjoy showing off to a crowd whether it's his the piaffe and passage or the Levade under saddle. 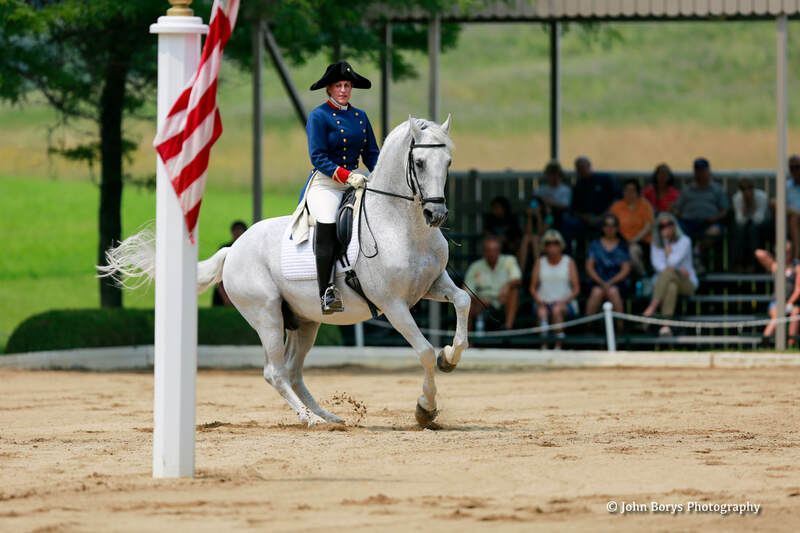 He has also performed the Quadrille and is known for memorizing the Quadrille pattern before his rider. In 2015, he was one of the horses to perform in the Dixon Oval at Dressage at Devon for their 40th Anniversary Show. About: Conversano Mima Anita has moves like a kangaroo; he performs a mostly strength and balanced movement called the Courbette in the Airs Above Ground segment. He is also a gifted competition horse with beautiful gaits and has competed through fourth level. Always a steady and loving horse, he is a barn favorite. When he's not working, his favorite pastime is cuddling. In 2015, he was one of the horses to perform in the Dixon Oval at Dressage at Devon for their 40th Anniversary Show. About: Favory VI Bellanna knows you love his work, even before you've seen it. He performs the capriole, a split second movement in which the horse jumps up and kicks out violently. When you see it, you can picture how intimidating it would be on the battlefield. The bond between him and his trainer is always evident, and he loves performing for a crowd. Watch him when everyone claps and see if you can see him basking in the admiration of the crowd. About: Another one of our breeding stallions, Bellanna is the most highly trained horse in our barn, capable of performing all of the Grand Prix movements. As a young horse he earned some distinction at local competitions and then winning the Champion Lipizzan at Dressage at Devon in 2004 and placing second in the FEI 6 year old Stallion class. About: Neapolitano VI Anita is one of our most highly trained horses. The work on the long rein first requires that the horse learn all the movements under saddle and then re-learn them on the long reins. This is no easy task and takes a very special connection between horse and trainer. He puts his heart and sole into his work. Watch his face in particular during the performance, when he is relaxed and gets into the music his ears will flop to the beat of the music and his upper lip will wiggle with concentration. About:The Tempel Lipizzans acquired these two boys in the winter of 2014. They were a 3-time National Champion driving pair and their previous owners had retired them from competition. In spite of being in their late teens, these boys still have plenty of fire and a need for work. 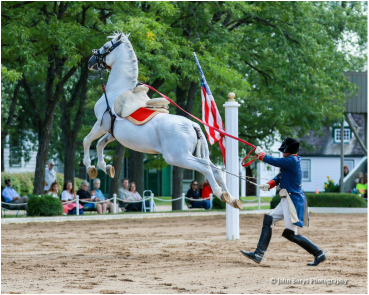 We were very excited to showcase such a talented pair of Hungarian bred Lipizzans in our summer performances. They adjusted quickly to the crowds and had the honorable duty of carrying our honored veterans in each performance during our 2015 season.